This chic and totally tailored chair is a fabulous way to furnish lofts, apartments, or townhomes. The sleek, modern silhouette is striking enough to catch the eye with its tightly attached back and minimalist track arms. Exposed wood wraps the seat base, while tall, tapered legs punctuate this look like a pair of stiletto heels. Furnished with eco-friendly, plant-based cushions for soft, resilient comfort. The 1108 Contemporary Chair with Track Arms and Exposed Wood Base by McCreary Modern at AHFA in the area. Product availability may vary. Contact us for the most current availability on this product. Fabric Options Available in an Assortment of 400 Fabrics and 30 Leather Options. Along every step of its production journey, upholstery from the 1108 collection was crafted with care. The look is purposefully tailored in a chic, modern outline, with slender track arms, tall, tapered wood legs, and an exposed wood base in the Danish modern style. The sofa and chair from this collection were crafted here in the US, making this collection the best choice for quality and sustainability. 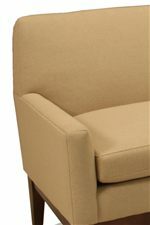 Plant-based foam cushions are a greener seating choice that provides you with the same resilient comfort as polyurethane foams. This distinctive collection was built specifically for the discerning homeowner, and the homeowner can make this piece truly their own by choosing from our wide variety of fabric patterns and colors to match their home decor. 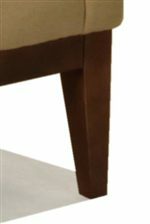 The 1108 collection is a great option if you are looking for Contemporary furniture in the area.